Research into the effect of sound in the oceans on marine mammals should be commissioned by the UK Government, a report recommends. The Inter-agency Committee on Marine Science and Technology says mammals are affected by many sounds, including sonar, oil exploration and shipping. It suggests research should include deliberately exposing mammals to noise. 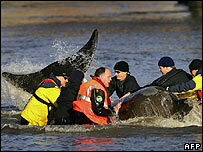 There has been speculation that the whale found in the Thames last month had been disorientated by sounds. "There are many sources of sound in the sea, including seismic surveys for hydrocarbons prospecting, shipping, offshore wind farms, military sonars and scientific research," said Professor Peter Liss from the University of East Anglia who chaired the report committee. "We therefore decided that the study must consider all these sectors and one of our conclusions is the need for better regulation underpinned by more research." The Inter-Agency Committee (IACMST) brings together experts from government departments and academia and reports to the government's Office of Science and Technology. Its new report identifies 13 cases of strandings by whales and dolphins which appear to have been linked to specific sources of noise; most of those sources involved naval vessels. Post-mortem evidence gathered after a number of whales beached themselves during military exercises in the Canary Islands four years ago indicated the presence of tiny gas bubbles in the animals' internal organs, particularly the liver, which scientists believe is linked somehow to sonar. Legal cases have been brought against the US Navy, while in the UK, conservation groups are pressing for a Parliamentary inquiry. the applicability of existing regulations and treaties for protection of the marine environment to cover underwater sound should be investigated, and amended where necessary. The most controversial of its proposals is the suggestion that the research should include "Controlled Exposure Experiments", where whales, dolphins, seals and other at-risk animals would be deliberately exposed to sound mimicking the noise of sonar, oil drilling and other activities. The committee notes that the idea arouses "ethical, political and practical issues", but concludes that the benefits would outweigh the risks if the research was done under proper regulation.